Represents a class template specialization, which refers to a class template with a given set of template arguments. Class template specializations represent both explicit specialization of class templates, as in the example below, and implicit instantiations of class templates. Definition at line 1647 of file DeclTemplate.h. Definition at line 719 of file DeclTemplate.cpp. Referenced by clang::FunctionTemplateSpecializationInfo::Create(), and CreateDeserialized(). Definition at line 732 of file DeclTemplate.cpp. Definition at line 1889 of file DeclTemplate.h. Definition at line 1891 of file DeclTemplate.h. Definition at line 739 of file DeclTemplate.cpp. Definition at line 757 of file DeclTemplate.cpp. References clang::C, ClassTemplateSpecializationDecl(), and clang::Result. Gets the location of the extern keyword, if present. Definition at line 1852 of file DeclTemplate.h. Referenced by getSourceRange(), clang::ASTDeclWriter::VisitClassTemplateSpecializationDecl(), and clang::ASTNodeImporter::VisitClassTemplateSpecializationDecl(). 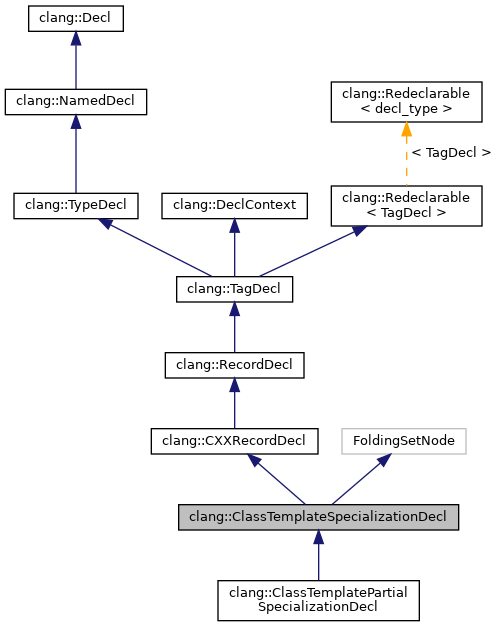 If this class template specialization is an instantiation of a template (rather than an explicit specialization), return the class template or class template partial specialization from which it was instantiated. Definition at line 1777 of file DeclTemplate.h. Definition at line 1725 of file DeclTemplate.h. Appends a human-readable name for this declaration into the given stream. This is the method invoked by Sema when displaying a NamedDecl in a diagnostic. It does not necessarily produce the same result as printName(); for example, class template specializations are printed with their template arguments. Definition at line 765 of file DeclTemplate.cpp. References clang::TemplateArgumentList::asArray(), clang::NamedDecl::getNameForDiagnostic(), getTemplateArgs(), and clang::printTemplateArgumentList(). Get the point of instantiation (if any), or null if none. Definition at line 1762 of file DeclTemplate.h. Referenced by clang::Sema::propagateDLLAttrToBaseClassTemplate(), clang::ASTDeclWriter::VisitClassTemplateSpecializationDecl(), and clang::ASTNodeImporter::VisitClassTemplateSpecializationDecl(). Source range that this declaration covers. Definition at line 788 of file DeclTemplate.cpp. References Begin, End, clang::TagDecl::getBraceRange(), clang::SourceRange::getEnd(), clang::TypeLoc::getEndLoc(), getExternLoc(), getInstantiatedFrom(), clang::ClassTemplatePartialSpecializationDecl::getInstantiatedFromMember(), clang::TemplateDecl::getSourceRange(), getSpecializationKind(), getSpecializedTemplate(), getTemplateKeywordLoc(), getTypeAsWritten(), clang::TypeSourceInfo::getTypeLoc(), clang::SourceLocation::isInvalid(), clang::SourceLocation::isValid(), clang::TSK_ExplicitInstantiationDeclaration, clang::TSK_ExplicitInstantiationDefinition, and clang::TSK_ExplicitSpecialization. Determine the kind of specialization that this declaration represents. Definition at line 1741 of file DeclTemplate.h. Referenced by getSourceRange(), clang::Sema::propagateDLLAttrToBaseClassTemplate(), clang::ASTDeclWriter::VisitClassTemplateSpecializationDecl(), and clang::ASTNodeImporter::VisitClassTemplateSpecializationDecl(). Retrieve the template that this specialization specializes. Definition at line 780 of file DeclTemplate.cpp. Referenced by DeduceTemplateArguments(), getSourceRange(), isFunctionLocalClass(), clang::Sema::isMoreSpecializedThanPrimary(), clang::Sema::isStdInitializerList(), clang::Sema::propagateDLLAttrToBaseClassTemplate(), shouldConsiderTemplateVisibility(), clang::ASTDeclWriter::VisitClassTemplateSpecializationDecl(), and clang::ASTNodeImporter::VisitClassTemplateSpecializationDecl(). Retrieve the class template or class template partial specialization which was specialized by this. Definition at line 1789 of file DeclTemplate.h. Referenced by adjustDeclToTemplate(), and clang::ASTDeclWriter::VisitClassTemplateSpecializationDecl(). Retrieve the template arguments of the class template specialization. Definition at line 1735 of file DeclTemplate.h. Referenced by DeduceTemplateArguments(), clang::Sema::DeduceTemplateArguments(), getNameForDiagnostic(), isCharSpecialization(), isFunctionLocalClass(), clang::Sema::isStdInitializerList(), isStreamCharSpecialization(), shouldConsiderTemplateVisibility(), clang::ASTDeclWriter::VisitClassTemplateSpecializationDecl(), clang::ASTNodeTraverser< Derived, NodeDelegateType >::VisitClassTemplateSpecializationDecl(), and clang::ASTNodeImporter::VisitClassTemplateSpecializationDecl(). Retrieve the set of template arguments that should be used to instantiate members of the class template or class template partial specialization from which this class template specialization was instantiated. For a class template specialization instantiated from the primary template, this function will return the same template arguments as getTemplateArgs(). For a class template specialization instantiated from a class template partial specialization, this function will return the deduced template arguments for the class template partial specialization itself. Definition at line 1808 of file DeclTemplate.h. Gets the location of the template keyword, if present. Definition at line 1871 of file DeclTemplate.h. Gets the type of this specialization as it was written by the user, if it was so written. Definition at line 1847 of file DeclTemplate.h. True if this declaration is an explicit specialization, explicit instantiation declaration, or explicit instantiation definition. Definition at line 1752 of file DeclTemplate.h. Referenced by shouldConsiderTemplateVisibility(), and clang::ASTNodeImporter::VisitClassTemplateSpecializationDecl(). Definition at line 1745 of file DeclTemplate.h. Referenced by clang::Sema::propagateDLLAttrToBaseClassTemplate(), and shouldConsiderTemplateVisibility(). Definition at line 1877 of file DeclTemplate.h. Definition at line 1882 of file DeclTemplate.h. Sets the location of the extern keyword. Definition at line 1857 of file DeclTemplate.h. Note that this class template specialization is actually an instantiation of the given class template partial specialization whose template arguments have been deduced. Definition at line 1819 of file DeclTemplate.h. Note that this class template specialization is an instantiation of the given class template. Definition at line 1831 of file DeclTemplate.h. Definition at line 1766 of file DeclTemplate.h. Definition at line 1757 of file DeclTemplate.h. Sets the location of the template keyword. Definition at line 1864 of file DeclTemplate.h. Sets the type of this specialization as it was written by the user. This will be a class template specialization type. Definition at line 1839 of file DeclTemplate.h. Referenced by clang::TemplateDeclInstantiator::InstantiateClassTemplatePartialSpecialization(), and clang::ASTNodeImporter::VisitClassTemplateSpecializationDecl(). Definition at line 1705 of file DeclTemplate.h. Definition at line 1706 of file DeclTemplate.h.